It’s easy to look at political bluster and judge it as such—just talk. SNAP benefits are in trouble. But it has real effects, as new research presented at the American Public Health Association’s 2018 annual meeting shows. The requirements for who is eligible to take advantage of SNAP, better known as food stamps, haven’t changed. But for the first time in a decade, fewer of those eligible for the program, especially recent immigrants, are enrolling. Between 2007 and 2017, according to the APHA’s research, enrollment among those immigrant families who qualify for SNAP steadily raised. 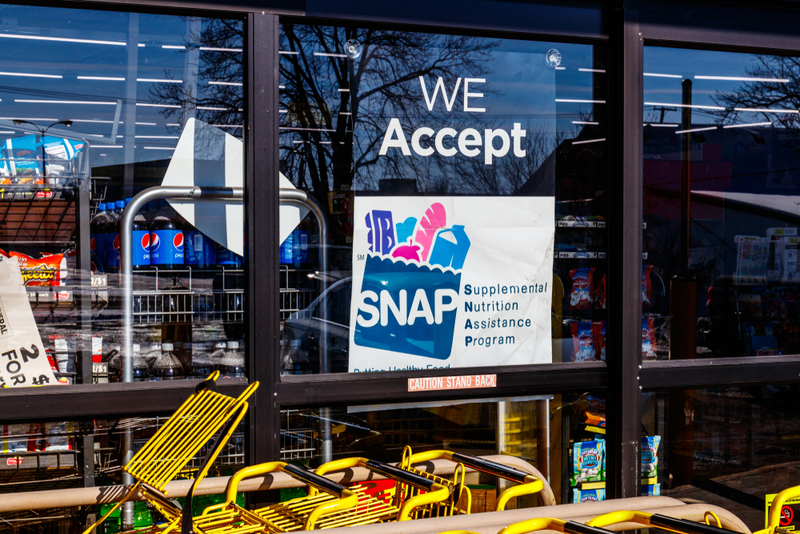 SNAP, which stands for the Supplemental Nutrition Assistance Program, has federal rules with some tweaks state by state. In general, individuals and households qualify if their income is below 130 percent of the federal poverty line; there are a bunch of other calculations which might vary by location involving what kinds of resources (cash, property, cars) are owned. Non-citizen individuals are very rarely eligible for SNAP (and undocumented immigrants never are), but legal immigrants who have been in the country for more than five years are eligible if they fulfill the other requirements, even if their household includes someone who hasn’t been in the country long enough to be eligible. Households with children under the age of 18 can forego that five-year rule, and are eligible. This survey is not looking at fraud; everyone surveyed is legally entitled to these benefits. The question is: how many are actually using them? Surveying 35,000 mothers of young children in Boston, Baltimore, Philadelphia, Minneapolis, and Little Rock, the APHA found that between 2007 and 2017, enrollment for eligible families was steadily on the rise. By 2017, households with a mother who had been in the country for less than five years, but which had young children and were thus eligible, was up to 43 percent. For similarly eligible families with an immigrant mother who had been in the country for more than five years, that number hit 44.7 percent. It’s probably worth noting here that at its peak, fewer than half of some of the country’s neediest families were actually using the benefits they were legally entitled to. Immigrant families, in general, tend to use SNAP at much lower rates than American-born eligible families. But in 2018, though there has been no change at all in the eligibility requirements, those numbers dropped dramatically. Families with a mother who came to the US fewer than five years ago went from 43 percent to 34.8 percent. Those with a mother who had been in the US for more than five years dropped from 44.7 to 42.7 percent. After a decade of steady increases, and with no legal reason for that not to continue, everything changed between 2017 and 2018. Actions and rhetoric from the Republican Party, especially President Trump, have stoked fears that signing up for benefits—benefits that these people are legally entitled to—may cause them problems down the road. Proposed new rules from the Department of Homeland Security, following a leaked executive order plan from Trump, would view signing up for legal benefits as a mark against eventual citizenship. If passed, the rule would allow authorities to revoke legal resident status from those who had enrolled in benefit programs like SNAP. Aside from being an abhorrent attack on the needy, there are plenty of economic arguments in favor of extending these sorts of benefits to immigrants; more on that here. But the tactics proposed by the Trump administration, judging by this APHA survey, seem to be working. The President is just doing his job. No need to slam him about that. Immigrants are not supposed to be public charges. Good news. Fewer illegal aliens are using Snap. Thank you President Trump. Give the benefits to true American homeless and veterans. Thanks to President Trump for doing what is in the best interest of America. I believe our Canadian neighbors to the north do not provide SNAP type funds for immigrants. I dont understand why we are so critical. You also want a balanced budget for our country. Any good ideas on how to do this when so many hands are out for government money. Which way do you want it? Stop all the freebies and the illegal numbers will drop. I’m personally sick and tires of working and paying huge taxes to cover everyone’s asses in not just this country but the world. 68 and still working plus 40 hrs.per week. So under Obama, food stamps went up, under Trump food stamps go down. Thank you Trump for creating jobs.